I’ve drifted further north now to spend a week aboard a century-old Dutch sailing schooner exploring some of the inner islands of the Seychelles. This little Republic comprises more than a hundred granite and coral islands scattered over an area of a thousand kilometres in the Indian Ocean off the coast of East Africa. The seas in this region are unusually calm and protected, the waters an amazing turquoise and aquamarine blue and the temperature that of a warm bath. The islands were uninhabited before the great European naval expeditions of the 18th and 19th centuries but then rapidly populated with African slaves from whom the Creole people today are descended. The region was favoured in history by Corsairs and pirates who took respite in these sheltered bays in between plundering trading ships from the Spice Islands. In similar fashion dropping anchor at a new island each day has given me a glimpse of the riches dotted around the Seychelles. The Scubadiving here has been a relaxing treat- rolling out of my bunk each day and falling into warm tropical waters with visibility between 20 and 40m – it’s unusual to find the combination of clarity and warmth. While the patchy coral is not a highlight, the underwater landscapes and concentration of fish delight. The cast and crew frequently also included reef sharks, turtles and octopus for every dive. 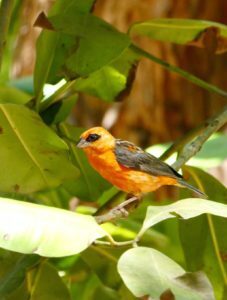 Such is the uniqueness of the wildlife in the Seychelles that a couple of the islands have been declared world heritage zones and several have national parks or are now exclusive nature reserves. 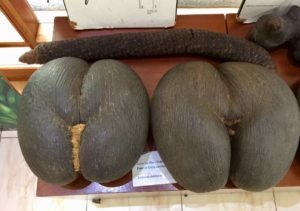 The largest seed in the world comes from a unique coconut palm “Coco de Mer” which only grows on 2 small islands in the Seychelles and has never been propagated elsewhere. The mammoth nuts are bilobed and resemble the thighs and crotch of a shapely woman. They can weigh up to 40kg! 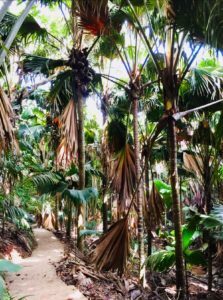 Upon their discovery a British Captain declared the palm grove to be the original garden of Eden with the fruit tracing Eve’s silhouette. The other surviving treasure of the Seychelles is the giant land tortoise of Aldabra. These lumbering prehistoric creatures can now be found across many of the islands chomping on leaves and napping in the shade. It is another unique Seychelloise experience to wander among these beasts which can live for hundreds of years. 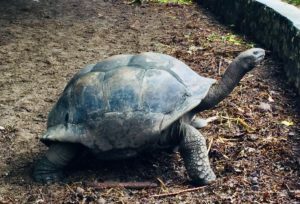 This entry was posted in The Seychelles and tagged Coco de mer, Giant tortoise, Seychelles. Bookmark the permalink.